This paper describes a large scale load trial of a weak foundation treated with vibro-replacement stone columns, at Newcastle Australia. The trial represented a rare test of the performance of stone columns under significant load, and was closely monitored using an array of geotechnical instrumentation. As part of the design verification process a large scale load trial was undertaken, comprising a test pad measuring 45 m by 45 m at the base, applying 140 kPa to the stone columns at foundation level. The trial was extensively monitored and the geotechnical instrumentation included settlement monitoring plates, hydrostatic profile gauges, inclinometers, earth pressure cells and perimeter “vector points”. Aspects discussed include the trial pad design, the instrumentation used, the performance of the trial pad and the monitoring results. The actual vertical and lateral deformations are compared to those predicted and show excellent agreement. The Port of Newcastle is the largest coal exporting port in the world. Port Waratah Coal Services (PWCS) operates two export coal terminals: Carrington and Kooragang Island. The Kooragang Coal Terminal (KCT) has been in service since 1984 and over the years a series of expansions has given it an export capacity of 77 million tonnes per year. Kooragang Island separates the North and South Arms of the Hunter River, and was formed by the reclamation of a number of smaller islands, channels and mudflats. The highly compressible soft soils lead to significant stability and foundation settlement issues for KCT structures associated with the coal stockpiles, stackers, reclaimers and coal conveying streams. Historically, foundation treatment for coal stockpile pads and machinery berms has comprised preloading, generally because of the availability of both sufficient time and plenty of sand (from dredging of the river). The most recent expansion “Project 3D” presented new challenges in that there were substantial operational benefits to be gained from a shorter construction period, and limited sand available for use as preload material. As a result a number of different foundation treatment methods were investigated by the EPCM contractor Bechtel Australia Pty Ltd. Following a rigorous review, including site visits, technical and safety risk analyses, vibro-replacement stone columns were selected as the most appropriate form of ground improvement for the project. The project was let on a design and construct basis and included a large-scale load trial as part of the design verification process. The location selected for the trial was typical of the poorer ground conditions present within the ground treatment contract area. 5 Bedrock Bedrock comprises siltstone and sandstone at depths of 50 m to 70 m, initially highly weathered and very low strength, improving with depth. The typical soil properties of the compressible (clayey) strata at the site are outlined in Table 2.2. Geotechnical analysis indicated that without ground treatment, neither the stability of the structures during construction and initial loading, nor the serviceability of the facility could be assured. Based on the performance of previously constructed phases of the coal terminal the client had identified the sensitivity of the plant to differential movements, and set strict performance criteria for the improved soils, as outlined in Table 3. 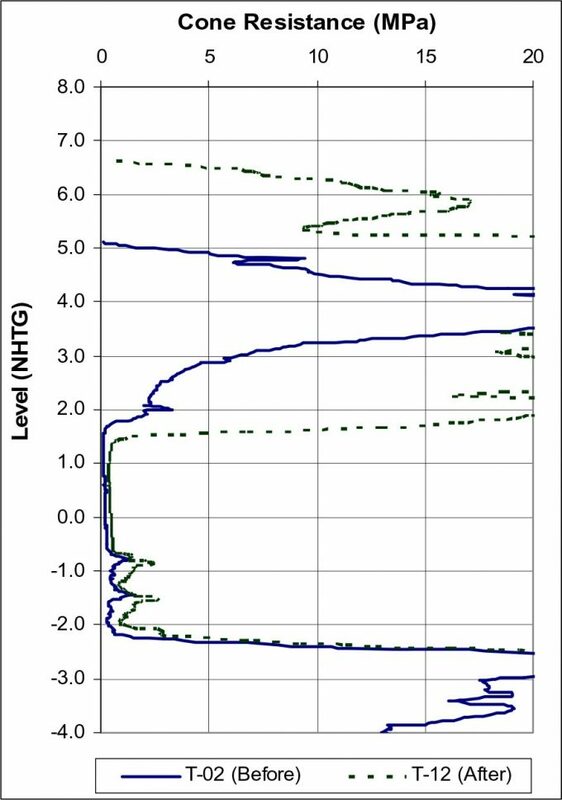 Without ground treatment there would be substantial settlements over time, as well as a high risk of shear failure upon initial application of the loads. 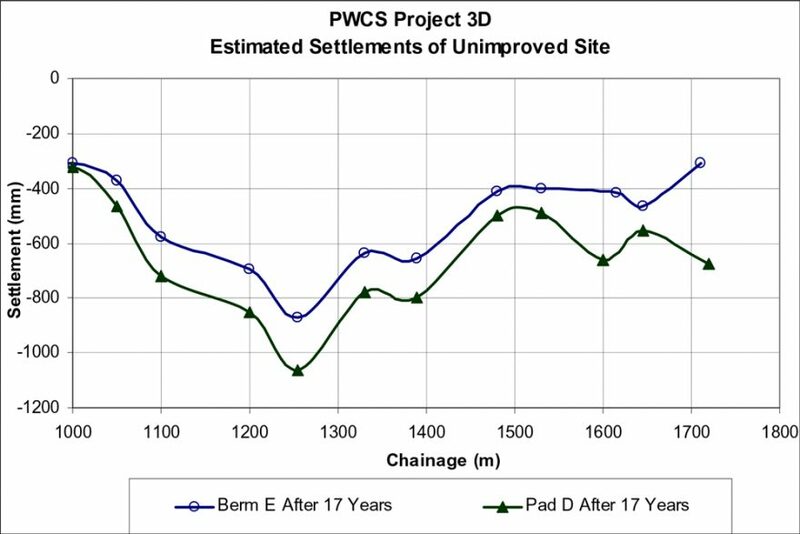 The predicted settlements of the foundation, in the area of the trial pad, in the case of no ground treatment, are shown in Figure 1 below. These values include settlement of the deeper clay layers and creep. The trial pad was constructed at Chainage 1250, where the upper soft clays were 4.2 m thick. The aim of the pad was to exert a foundation pressure similar to the berm and coal pad, as well as a gradation in pressure similar to the batter slope on the berm. A target pressure of 140 kPa was selected, considering the limitations of the site and available time-frame for construction. As it was not practical to construct a 7 m to 8 m high embankment with associated batter slopes, it was decided to construct a 5 m high fill embankment with the addition of sand-filled shipping containers to add further load. The trial pad was 20 m square at the top, with batters of 2H:1V on two sides and 3H:1V on the remaining two, resulting in base dimensions of 45 m square. Slope stability and construction risk were thoroughly examined and safety measures put in place during construction and monitoring of the trial pad. 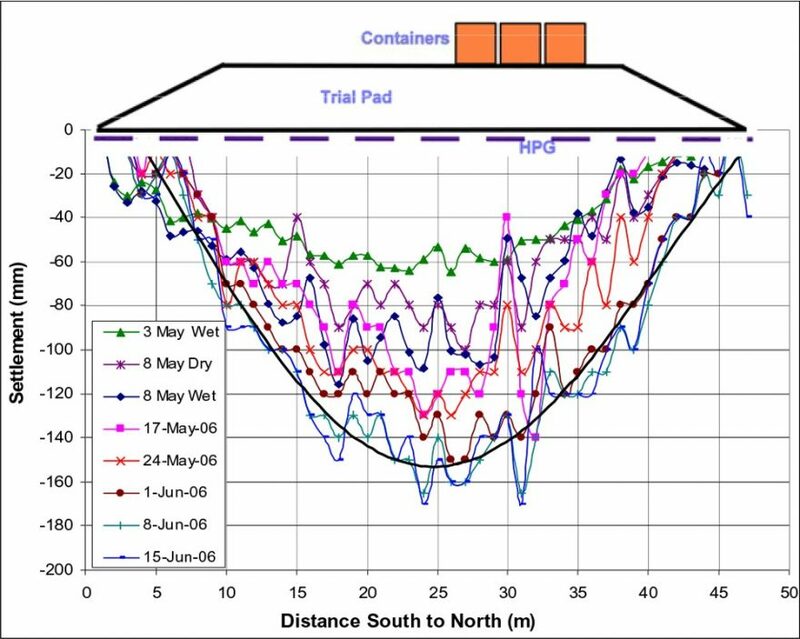 Numerical modelling of the trial pad arrangement was carried out prior to constructing the test pad by both the Contractor’s consultants (Chan et al, 2007) and Principal’s consultants to provide a prediction of the expected vertical and lateral deformations. 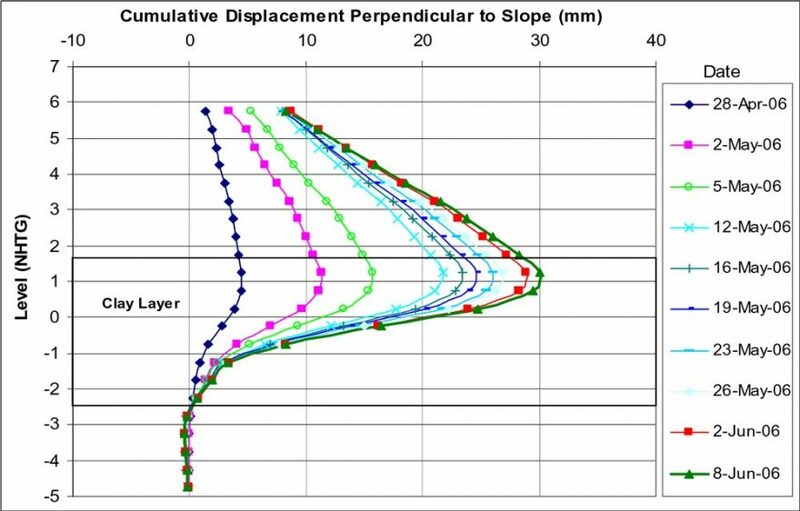 Vertical settlement was predicted to be about 160 mm to 180 mm, while lateral displacements were estimated to be 20 mm to 30 mm, with the greatest deflection expected to be near the top of the clay layer beneath the toe of the trial pad batter slope. 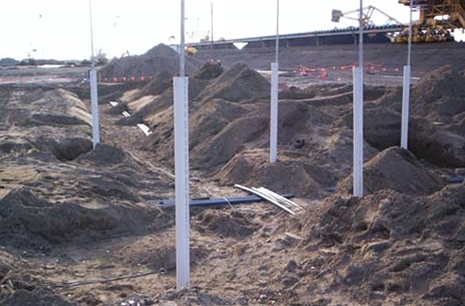 An array of geotechnical instrumentation was installed beneath and within the trial pad. These comprised six settlement plates, two hydrostatic profile gauges, eight inclinometers, three load cells and eight earth vector points around the perimeter of the trial pad. Two of the load cells were located directly over stone columns, while the third was located in between columns. The inclinometers comprised four around the toe of the batter, and four on top of the pad, around the containers. 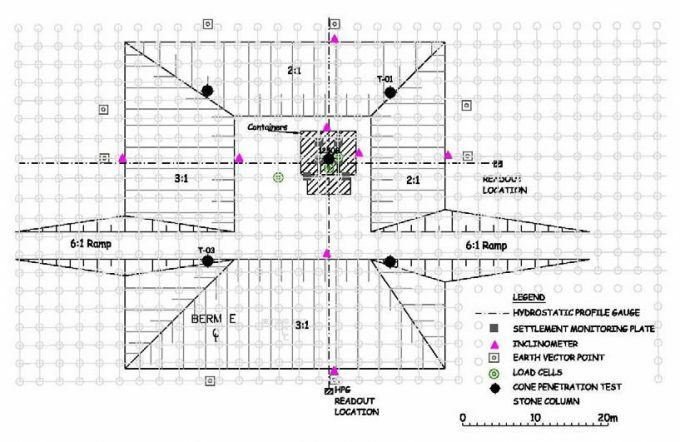 The trial pad layout and the location of instruments are shown in Figure 3 below. Figure 4 (left): Instruments prior to placing fill. 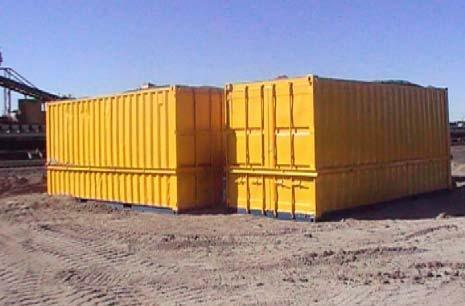 | Figure 5 (right): Containers on top of trial pad. The principal results of the monitoring are shown in Figures 6 to 8 below. Primary consolidation was deemed to be substantially complete after about 40 days, which was consistent with the designer’s expectations. The settlement plates recorded total vertical movements in the range 112 mm to 153 mm, slightly less than predictions. 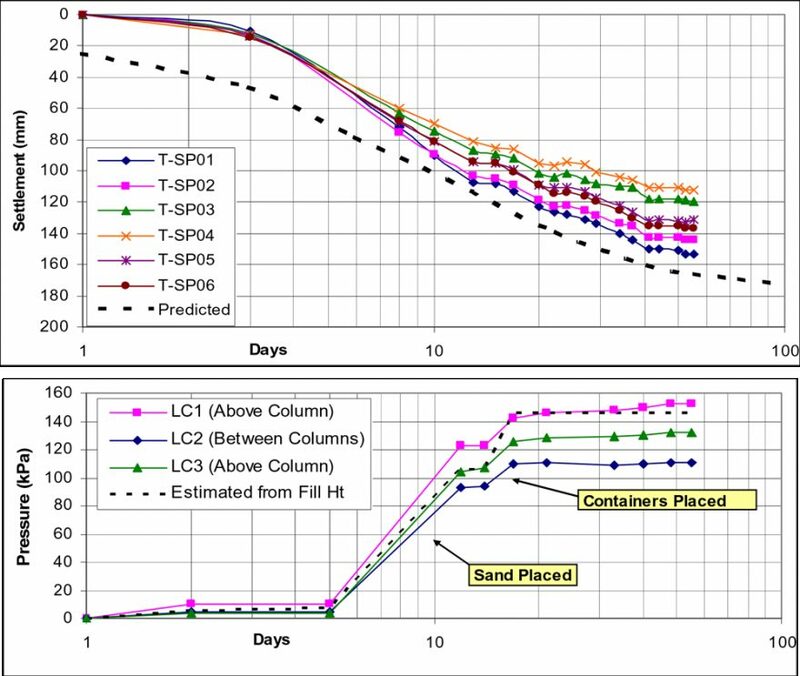 he lateral deflections in the clay layer were up to 30 mm beneath the toe of the fill batter (see Figure 7) and up to 8 mm beneath edge of the containers, which were close to the predictions of both consultants. The HPGs recorded 160 ±20 mm (see Figure 8) beneath the centre of the trial pad and exhibited a bowl-shaped deflection profile. The accuracy (repeatability) of the HPG’s was disappointing, being poorer than the manufacturer’s specification of ±10 mm. Nevertheless, the overall magnitude and deflected shape was consistent with expectations. The five cone penetration tests (CPT) carried out before stone column installation were repeated after the trial (in between columns), and revealed an increase in clay shear strength in the range 50% to 100%. This is a result of consolidation of the clay, as the soil takes a minor portion of the load, while the stone columns carry a major portion. The load cells implied that the columns attract up to 58% of the load, however the actual value is expected to be closer to 80%. Figure 9 shows the cone resistance plot from one of the before and after CPTs. The large-scale load trial of stone columns at Kooragang Coal Terminal provided a valuable test of the performance stone columns under near full-scale load. The sand-filled containers were successful in adding further load to the foundation as intended. The trial confirmed predicted behaviour and successfully verified the methods and material properties adopted for the design of the vibro-replacement foundation treatment. The details of the material properties and design methods are the subject of a separate paper (referenced below). The authors wish to thank the owners Port Waratah Coal Services for the permission to publish this paper and acknowledge the contributions of Will Wright of Douglas Partners for the trial pad instrumentation, Kim Chan of GHD and Raj Deepak of Keller who carried out the design and contractor’s predictions, and Danny Laverick for the execution of the works. Chan.K, Deepak.R, Hoffmann.G and Jones.P (2007). Designing stone columns to control horizontal and vertical displacements, Proc 10th Australia New Zealand Conference on Geomechanics, Brisbane, October 2007.